Recently (SuperBowl Sunday, in fact), I was at a women’s event where a couple of women a few years ahead of me on the kid timeline were talking about college, and about how a book called The College Solution changed their approach to choosing colleges and saved them hundreds of thousands of dollars. My kids have years yet before we have to start thinking about that, but it’s probably a good idea to start planning, especially if I can save a buck. Or a few hundred thousand. All this talk of impending financial strain was on my mind when someone (a reader!) from OpenTable reached out to let me know about some great prix-fixe menus that are on tap for Valentine’s Day and I thought, YES! Because what is more romantic than showing you ways to save money on your Valentine’s Day / week dinner so that you can save for college? Oh, and if you don’t have college tuition to pay for, and even if you don’t celebrate Valentine’s Day, this will still save you money. You’re welcome. So without further ado, here is the link that will save you tons of money and help you pay for college (sort of). Addison at the Grand Del Mar. Make no beans about it, it’s expensive. And I’m pretty sure they don’t even serve beans. But if you’re looking for luxury with a discount, this is an opportunity to dress up, check out fancy cars in the parking lot, and savor a delicious meal. $155/person. Cucina Enoteca Del Mar. Wine bottles on the walls? Horses hanging from the ceilings? All are here at Cucina Enoteca, where there is no shortage of burrata and I have had nothing but deliciousness to report. Prix-fixe menu available. Cucina Urbana. Cucina Enoteca’s sister restaurant downtown has a $48 prix-fixe menu that will not disappoint. D Bar San Diego. 6 courses!!! 3 desserts!!! Did you hear that? I said THREE DESSERTS. All for $75/person. You will recall that D Bar is where we had our MasterChef encounter, so it holds a special place in my heart. The Red Door. So cute. So cozy. So delicious. 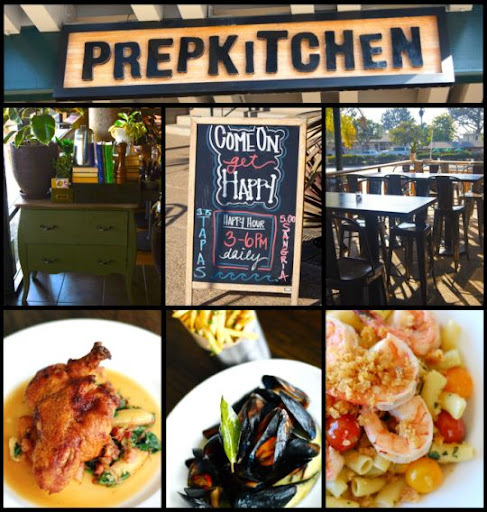 3 course menu for two, $80. Saving you money, one bite at a time. San Diego is known for its natural beauty, and perhaps even for its artificial beauties, but a foodie haven? Not so much. Having lived collectively in Chicago, New York, Boston, London, Paris and Tokyo before moving here, my husband and I had to adjust to living in a place where people seemed too busy working out to be concerned with food. Which saddened me, because Food, you complete me. I want to start brewing my own vinegar. That will make for two pets in my home: a 5-year-old sourdough starter named Pete (which is also what my daughter calls the holes in her jeans), and a vinegar mother that will heretofore be known as Wilma. Fermented pets are the best ones. 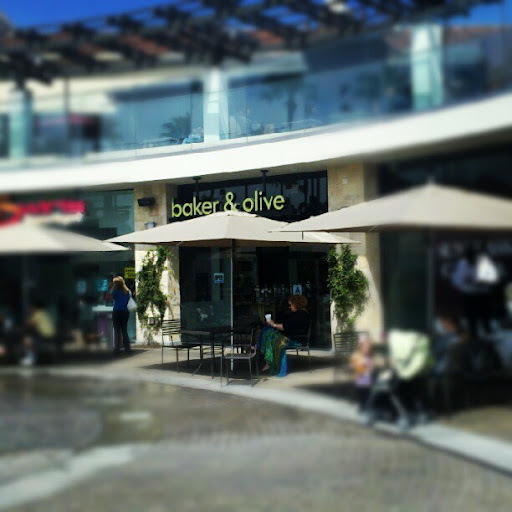 You can imagine my excitement when Baker & Olive appeared in my neighborhood. You can be excited too, because you can order online. 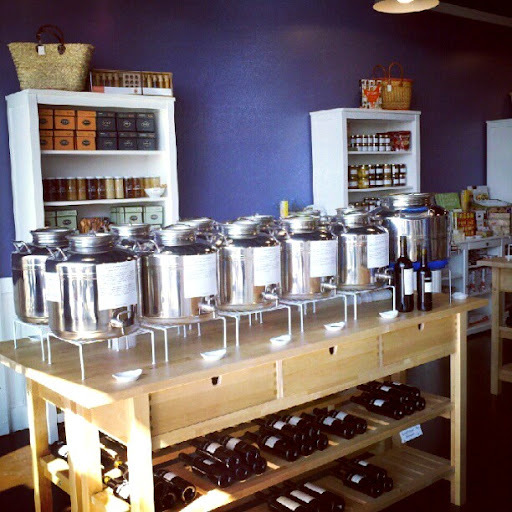 This is a place where they allow you to drink olive oil and balsamic vinegars out of a cup. It’s like the land of milk and honey without the milk (but a good selection of raw honey). See those silver things? They’re like kegs of olive oil and vinegar, and when you walk in the staff dispenses these deliciously viscous liquids for straight from the tap. They’ve got beautiful gift sets as well which are a nice way to try a variety of flavors. Why yes, I do drink gravy, why do you ask? Back to the vinegars: a nice variety vinegars, both balsamics and lighter ones. I was focused during my visit on the balsamics; you can see some of the varieties here. 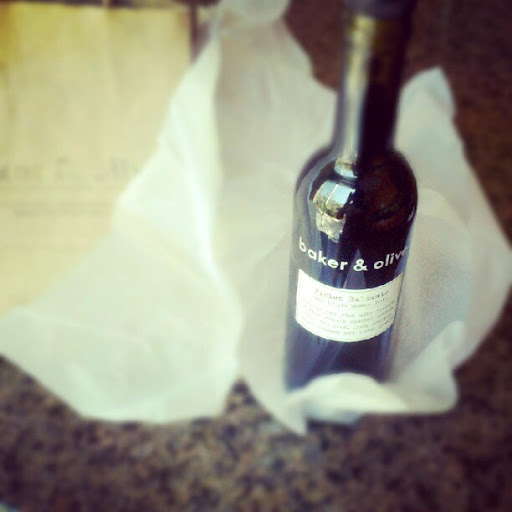 Their website says that “the density and complexity of our balsamic vinegars are a testament to the fact that they are made in Modena, Italy from high quality grape must, cooked down over an open wood fire and aged in oak barrels without the addition of much else, unlike so many “balsamic-like” products on the market.” Whatever they did, this vinegar is smooth, rich and complex. I bought a bottle of the violet-infused vinegar, which has a lovely fragrant bouquet; I tasted a strawberry balsamic which would be divine over a panna cotta topped with berries. The violet balsamic, while lovely in concert with olive oil with bread as a convenient carrier, was a bit too floral for my standard vinaigrette — and I make vinaigrettes just about daily, so I need to head back to get a good basic balsamic. I’m a vinegar novice though, so would love to hear if anyone else has experience making vinegars, or if you have recommendations on particularly good ones. Excuse me while I have a glass of the violet now.